Dynamic Design and Manufacturing, Inc. provides wire electrical discharge machining (EDM) services, commonly referred to as wire EDM, spark erosion, spark machining, or wire erosion, for clients worldwide, meeting custom requirements and tolerances. 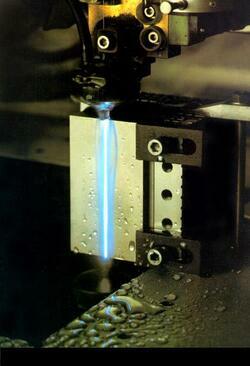 Wire EDM is performed by utilizing sparks (electrical discharge) to create the shape. The materials are removed by a rapid current of electrical discharge within the electric field that is created between the gap of the workpiece and machine. This is an ideal process for delicate parts that cannot be machined from traditional processes. As a leading Colorado metal fabricator located outside of Denver, we specialize in wire EDM for various industries and applications, including medical, aerospace, national defense, telecommunications, and process control instrumentation applications. Dynamic Design & Manufacturing performs wire EDM on stainless steel, carbon steel, aluminum, nickel alloys, and titanium alloys. Our expert engineering and production staffs are supported by our companywide commitment to quality and customer satisfaction. At Dynamic Design and Manufacturing we are proud of our reputation for manufacturing the highest quality precision machined parts that meet or exceed your expectations. Dynamic Design and Manufacturing's 31,000 sq. ft. facility located in Niwot, Colorado is equipped with automated Wire EDM and CNC machining capabilities integrated with our laser cutting, punching, forming, rolling, welding, hardware installation, and finishing equipment, providing complete machining and fabricating services. Our multi-axis CNC Wire EDM equipment offers an efficient, precision process for achieving custom contouring, surfacing, and tapering. Our state-of-the-art precision CNC Wire EDM equipment offers excellent repeatability and can achieve fine tolerances, ensuring that your finished product will meet your required specifications. Consistency – conventional cutting tools can wear down or break throughout the cutting process, which results in small inconsistencies in the final product. Wire EDM machines cycle new wire between spools to product consistent quality. Material Compatibility – wire EDM can make exact cuts on wide variety of materials than other cutting services. Our wire EDM machine can machine harden metals like graphite or softer metals like copper. Eliminates Finishing – Dynamic Design & Manufacturing produces ultra-fine finishes which do not require additional surface treatment. At Dynamic Design & Manufacturing, our wire EDM cutting services uses an electrically energized wire to slice through metal. This process is also known as electrical discharge machining. This method uses controlled, repetitive and rapid spark discharges from the wire to the metal which erodes the metal away. The only way for this process to work effectively is the metal must be electrically conductive. We have expertise in working with hard and soft metals. Our wire EDM cutting can be applied to Aluminum, Brass, Bronze, Copper, Spring Steel, Stainless Steel, Steel and Titanium, which are super alloys and difficult metals to machine. The wire EDM cutting process can also cut most simple or complex 2D shapes including thin walls and cutouts, intricate openings and sharp corners. Our equipment utilizes 0.004"-0.012" diameter wire to cut metals that are too hard for conventional machining. Some examples of parts that have been machined by wire EDM include: custom robot parts, mold components, punch and die tolling, custom gears and stripper plates. AgieCharmilles AC Progress V2 Wire EDM Work Piece Dimension: 29.5" x 21.65" x 9.8"
Table Travel 13.75" x 9.8"
Fanuc α1 iC EDM Work Piece Dimension: 41" x 28.7" x 12.2"
Table Travel 21.7" x 14.6"
Methods Hole Master CNC EDM Drilling System Work Piece Dimension: 15.75" x 15.75" x 12"
Our engineering staff can work with you to achieve the most cost effective design for manufacturing and our experienced production staff will manufacture your parts to meet your specific requirements. We have the capacity to produce quantities from prototype through high-volume production runs. Dynamic Design and Manufacturing is ITAR compliant and our manufacturing processes are ISO 9001:2015 certified so you can be assured that your parts will meet or exceed the quality and workmanship you require.